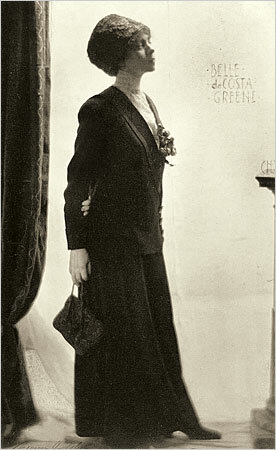 Pierpont Morgan’s librarian, Belle Costa Da Greene (1879-1950) is a fascinating woman. Her parents were of mixed ancestry – black and white. Her father, Richard Greener, was the first black graduate of Harvard. After early success, he was involved in scandal while ambassador to Russia and returned to the US to live out his life in obscurity. He had become estranged from the rest of his family, who wanted to ‘pass’ as white, while he wanted to stand up for black rights. Belle was working with Pierpont Morgan’s nephew Junius when he recommended her in 1905 for the post of librarian for Morgan’s library. Morgan had devoted himself to building up a collection of rare books and manuscripts for several years now and his basement was overflowing; he was building a library next to his house to hold his collection. Perhaps it was Belle’s charisma that persuaded Pierpont to take her on, even though she was a woman in a very masculine world and had no formal qualifications. She proved to be the best librarian one could imagine, building the library into an incredible collection. She was, we are told, brilliant at negotiating prices on rare items, a formidable and lively personality in society both in New York and Europe. She is marked by caprice and unpredictability; at time sounding feminist and yet joining the anti-suffragette movement; shifting from pacifist to vehemently pro-war over the course of the Great War. It would seem she didn’t want her story told. Ardizzone writes- “But in her generation Belle was not alone in scorning personal history as irrelevant, in destroying personal papers, and in maintaining very different public and private personas.” (9) In her final illness in 1950, she burned all her papers, an act that means many of her secrets will never be revealed. Indeed, it was not until 2007 that a full length biography – this one – was finally published. The biography is built on the letters Belle wrote to her lover and friend of over forty years, Bernard Berenson. He lamented that in burning the letters he sent her, she had destroyed his autobiography; he could not bring himself to do the same to hers, in spite of her request. Bernard, then, plays a massive role in the biography. It made me think about the difficult task of reconstructing a life, and the way sources skew any portrait. Was Bernard as significant in her life as the biography suggests? We’ll never know, but I would say he probably wasn’t, that he becomes significant as the source behind the biography. He is almost like the narrator of a novel.. and yet not; the letters Ardizzone is working from them are Belle addressing herself to him. Belle is the narrator, but Bernard is the audience. Her love affair with Bernard has its tragedy. At first, it was a chaste exchange of passionate letters; he was in Europe, she in New York. She was constrained by the shadow of the other man in her life: Pierpont Morgan himself. Morgan was jealous and possessive of her as a twisted sort of father figure in her life; he didn’t want her having affairs with any man and especially not Bernard. Indeed, he didn’t even want her marrying. When she returned to New York from London, she was a different woman. While once chastely flirting, she had no inhibitions any longer and, Ardizzone documents, affairs with many men. One thing I have loved in reading this biography is the strange intersections with famous and unlikely lives. Belle’s lover Bernard Berenson was married to the daughter of the still popular evangelical devotional writer, Hannah Whitall Smith. Hannah’s daughter, Mary, did not share her mother’s morality; she instituted an open marriage with Bernard, only to regret it later when he began his long love affair with Belle. Then there was Belle’s good friend Cardinal Ratti – former head of Vatican library – who became Pope Pius XI in the 1920s. She had friends in high places. Biographies are a strange narrative. Without the simpler narrative arc of a conventional novel, they draw toward the only ending they can : the deathbed, the funeral, the legacy. The middle of this biography feels as boring as life itself can be: the seemingly endless twists and turns of a love affair between Bernard and Belle, none of them decisive. But then things do change; her endless youth and energy desert her. She grows old, the death of her nephew in World War Two – an unacknowledged suicide – breaks her; she dies. It was, finally, for me a fascinating story, impressively researched, a remarkable feat, to bring this woman to life in a book. Albeit truncated, distorted, with gaps we would like to fill. She reminds me of Florence Broadhurst. Did you see the movie? I didn’t see the movie and can’t even remember about her, though I feel I should! I knew I’d heard that name! I did see the doco – only this year. I just forget her name. Fascinating story, and you’re right, some parallels to Belle. Gee whizz, that John Wayne Glover page is horrific.